It’s 1908, a year in the Edwardian Age, the year J.M. Barrie’s play What Every Woman Knows, premiered in Atlantic City and the first Model T rolled off the assembly line in Detroit. It is a year when the world faced one of its worst disasters in history, when the New Year would heal the wounds of loss. Louisa Borden lives a privileged life in Chevy Chase, Maryland, a new and thriving community on the outskirts of Washington, DC for the well-to-do. Against the wishes of her domineering grandmother, she retreats from the prospects of a loveless marriage and instead searches for what she hopes is her calling in life. When her horse is spooked along Rock Creek, she is thrown from the saddle—an embarrassing situation for any affluent young lady. Soaking wet, bruised and humiliated, she is carried up the muddy bank to safety by Jackson O’Neil, a stranger to the city, who changes the course of everything, including the lives of all those around her. Louisa Borden’s grandmother, Beatrice has decided that her granddaughter will marry Rupert Eastcott a wealthy man that will sure provide for and take care of Louisa. Miss Borden has a mind of her own, refusing her grandmother’s matchmaking, while Beatrice is determined to marry her granddaughter off to this Mister Eascott. Things change one day as Louisa was out riding and was thrown from her horse and stranger, Jackson O’Neil comes along to help. The two was attracted to each other, and the story begins! I really enjoyed this story. The characters were fun and enjoyable and I grew to love them as I read their story. Clearly Ms. Gerlach researched the book well before she wrote it, and it shows in the detailed scenes and the history surrounding each scene. This book has lots of emotions, drama, twists and turns, humor and a sweet romance that will stay with you for a while. I highly recommend this book for any0ne who enjoys historical Christian fiction, or if you have never read any of the great historical Christian fictions out there, this would be a great one to try! I received this book from Celebration Lit to read and review. I was not required to write a positive review. The opinions I have expressed are my own. I am disclosing this in accordance with the Federal Trade Commission’s 16 CFR, Part 55. 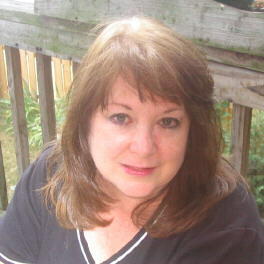 I’m a multi-published, bestselling author of Inspirational historical fiction, romance, and drama. Ever since I was knee-high to a flea, I would dream up stories. I loved books and illustrations, and going to the library or climbing into a bookmobile to explore the books on the shelves, was a special treat when I was a kid. Writing was within me. But it wasn’t until a day in the early 90s at a family reunion that my cousin, a famous romance author, handed me a copy of one of her books that the spark ignited into a fire to write. I took many paths to find my calling, and the joy of following through on it has been a tremendous part of my life journey. In many of my stories, I write about the struggles endured by early colonists, with a sprinkling of both American and English settings. Currently I am writing a new historical series set in the Gilded Age. My books are dramatic in the sense I don’t hold back on the trials people historically faced. So you won’t find stories made of sugar and syrup. Rita Gerlach lives with her husband and two sons in a historical town nestled along the Catoctin Mountains, amid Civil War battlefields and Revolutionary War outposts in central Maryland. In many of her stories, she writes about the struggles endured by early colonists, with both American and English settings. 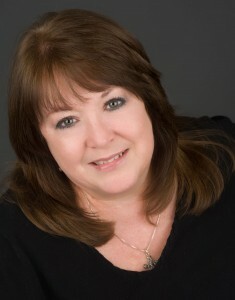 Her new historical series for Abingdon Press entitled ‘Daughters of the Potomac‘ was launched in February 2012, with Before the Scarlet Dawn, book 1, followed by Beside Two Rivers, and Beyond the Valley to be released in February 2013. In 2009, Abingdon Press released Surrender the Wind, which gained four and five star reviews. You can visit her blog at http://ritagerlach.blogspot.com. Connect with Rita on Facebook. Eliza Morgan’s daughter seeks to unravel a lifetime of memories and the absence of her parents, unaware that the young Englishman who loves her holds the answers. Her search takes her far from her beloved home along the Potomac, to a manor house in faraway England. Will she discover the secrets of the past and be reunited with the most important people in her life? Will Hayward and Eliza find peace and reconciliation? Will Darcy’s faith sustain her to make the difficult choices, and will love endure? 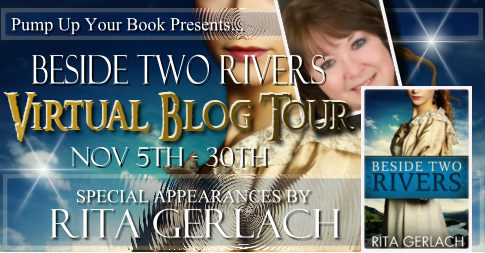 I really enjoyed this second book in the Daughters of the Potomac Series by Rita Gerlach. With the setting in Maryland and England in the late 1700’s, readers take an exciting journey with realistic character that are well developed throughout the story. I loved the vivid historical details of Maryland and England and I really felt as though I had taken a trip back in time. I thought Darcy was an interesting character and I found myself wanting her to find out about her parents and her past. And the unique meeting with Englishman Ethan Brennan brought enough excitement to the story that I couldn’t put the book down! Ms. Gerlach is a gifted writer and writes a story that is well worth reading. 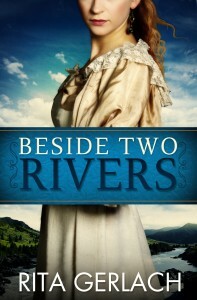 I highly recommend Between Two Rivers for your reading enjoyment. Pick up your copy today, and don’t forget to pick up the first book in this book. Though you can read this book as a stand along, it will be much more interesting if you read Before the Scarlet Dawn first. This book was provided by the publisher, Abingdon Press through Pump Up Your Book Tours. I was not expected or required to write a positive review. The opinions in this review are mine only. Rita Gerlach lives with her husband and two sons in a historical town nestled along the Catoctin Mountains, amid Civil War battlefields and Revolutionary War outposts in central Maryland. In many of her stories, she writes about the struggles endured by early colonists, with a sprinkling of both American and English history. Currently she is writing a new historical series for Abingdon Press entitled ‘Daughters of the Potomac’. 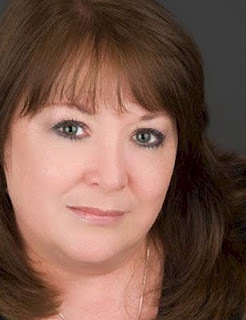 See her ‘Novels In Progress’ page on her website to learn more. There are other novels on her list to be published, and a proposal for another book series. She was born in Washington D.C. and grew up in a large family in the Maryland suburbs. Her family claims that storytelling is their blood, handed down from centuries of Irish storytellers. Rita believes there just may be something to that theory. Eliza Bloome. Her dark beauty and spirited ways are not enough to win him, due to her station in life. joins the revolutionary forces and what follows is a struggle for survival, a test of faith, and the quest to find lasting love in an unforgiving wilderness. 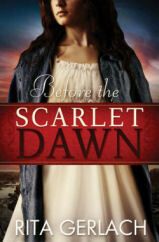 If you would like to read the first chapter of Before The Scarlet Dawn, go HERE. Before the Scarlet Dawn is somewhat different than most of the books I’ve read. It was kind of sad throughout the book, and not a happy go lucky ending. But the story line and characters are enough to keep you reading. There are other books in the series and I can’t wait to read those to get the whole story. Rita Gerlach is a wonderful writer and the chacters she created in this book are believable, realistic and interesting. And some of them you just grow to love as you read through the book. And even though a lot of the book was sadness, the author still has a way of keeping your attention and keeping you into the book. I couldn’t put it down at times. Hayward and Eliza captured my mine and with the twists and turns taking place I just had to find out what would happen. I encourage you to grab a copy of this book to read for yourself. If you like historical fiction and war stories, you will like this books. And don’t forget about the other in the series coming out. I was provided a copy of this book from Abingdon Press through Christian Fiction Blog Alliance to read and review. I was not requried or expected to write a positive review. The opinions in this review are mine only.